BRUSSELS (Reuters) - Euro zone growth is expected to slow in the coming years as the bloc faces risks from U.S. economic policies, Britain's unclear divorce terms from the EU and free-spending plans in high-debt members, like Italy, the EU Commission said. In its quarterly economic forecasts released on Thursday, the EU executive revised down its growth estimates for the euro zone next year and predicted a protracted slowdown until 2020, the last year for which forecasts are available. The revision, although expected, might complicate the European Central Bank's plans to wind down its stimulus programme this year, but in more positive news for the ECB the Commission forecast higher inflation of 1.8 percent this year and next in the bloc. The ECB targets a rate close to 2 percent. Under the forecasts, the euro zone will grow 2.1 percent this year after a 2.4 percent expansion in 2017. The slowdown will continue next year when growth is expected at 1.9 percent, slightly below the previous estimate of 2.0 percent. 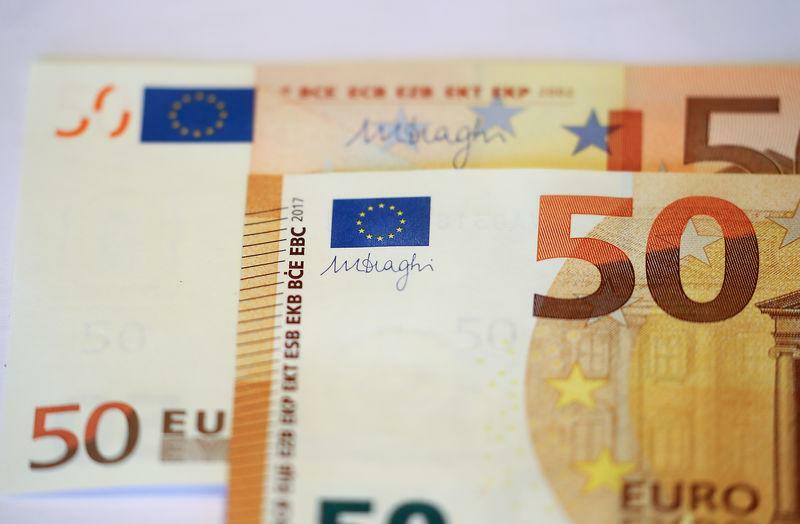 Although all euro zone states are expected to continue growing, in 2020 the bloc's economy will further reduce the pace of its expansion to 1.7 percent, the Commission said in its first estimates for that year. Germany, the bloc's largest economy, is expected to expand by 1.7 percent this year after 2.2 percent growth in 2017, the Commission said, revising down its earlier estimate of 1.9 percent. Next year German growth will be 1.8 percent instead of 1.9 percent. It will go back to 1.7 percent in 2020. Growth forecasts were revised down also for France and Italy, the second- and third-largest economies in the euro zone, with Italy remaining the worst performer in the common currency area, with forecast growth of just 1.1 percent this year, 1.2 percent next year and 1.3 percent in 2020. Italy's weak growth is partially matched only by Britain, which is not a member of the euro zone and will leave the EU in March. The British economy is estimated to expand by 1.3 percent this year and by 1.2 percent next, in line with previous forecasts. In 2020 growth is expected to remain at 1.2 percent. Projections on British growth are based on "a purely technical assumption" given the uncertain outcome of the Brexit negotiations, the Commission said. The EU overall is forecast to grow 2.1 percent this year, 1.9 percent next, and 1.8 percent in 2020. Brexit is one of the risks for the euro zone and the EU economy that could worsen the forecasts. The other main sources of uncertainties come from the United States and Italy, according to the Commission's analysis. "The balance of risks to the growth outlook is clearly tilted to the downside," economic affairs commissioner Pierre Moscovici told a news conference saying that negative effects from external and domestic risks "cast shadows" on the European economy. Overheating of the U.S. economy fuelled by "pro-cyclical fiscal stimulus" could lead to interest rates rising faster than expected, which would have numerous negative "spillover effects" beyond the United States, the Commission said, also warning of risks from trade tensions caused by the policies of the Trump administration and China's large exports to the United States. The other risk is Italy, whose eurosceptic government is pursuing free-spending policies despite its high debt, which is estimated to remain stable at around 130 percent of gross domestic product until 2020, instead of significantly decreasing as required by EU fiscal rules. "Doubts about the quality and sustainability of public finances in highly indebted Member States could spill over to domestic banking sectors, raising financial stability concerns and weighing on economic activity," the Commission said.